According to a survey conducted by CruiseCritic.com, nearly one-fourth of all passengers said they spent more than $200 on drinks per cruise. Alcohol is big business for cruise lines with some offering all-you-can-drink packages that cost around $42 a day. Save money on your next cruise by going alcohol-free. It will save you big bucks and you can still have a great time. Here’s a list of fun things to do that don’t require drinking. 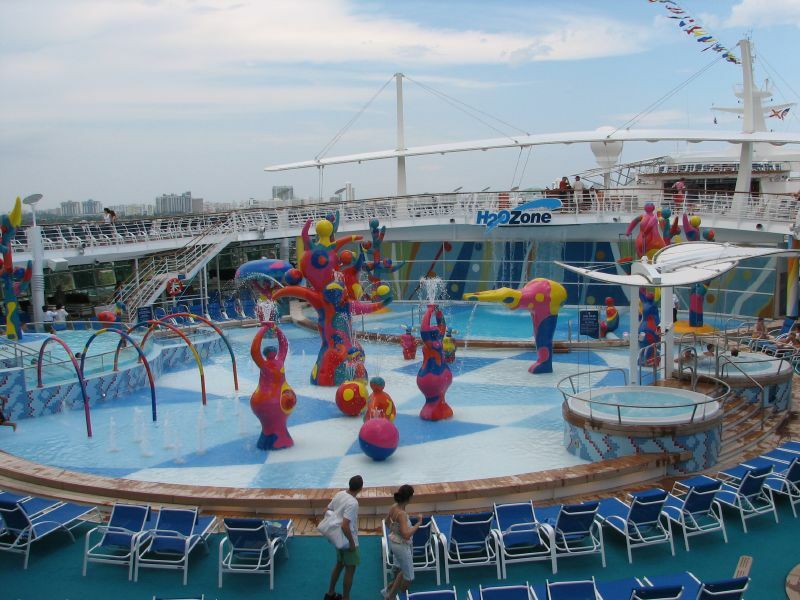 Pools are standard on all major cruise lines and are a great place to spend the day. There are typically different types of pools, like adults-only pools, wading pools, and splash pads. You’ll find pools with large screens for movies by the pool and ones with slides that land you right in the water. For the little ones, you’ll find some ships with splash decks especially for toddlers (which is helpful for ships that don’t allow diapered children in the pools) as well as wading pools that are only two feet deep. Cruise ships have nightclubs that feature dancing or karaoke at night. With many nightclubs to choose from, each with a different theme, choose the nightclub that best suits your mood and music preference. Though these clubs have bars where you can order mixed drinks, avoid the temptation by focusing on having fun with fellow cruisers. Watch your temptation levels while in the club. If the temptation to drink is too great, you may want to consider seeking professional help through alcohol rehabilitation. Dancing is a great way to let off some steam after spending the day relaxing next to the pool. Some cruises offer dance classes in ballroom dancing, so you can learn a skill with your sweetheart. There are many shows and entertainment available on cruise ships from musical performances and magic shows to comedy and Broadway shows. Some shows are for the whole family, such as ice skating performances, while others are just for adults, such as comedians. Many of the Las Vegas-style shows are top-notch with intricate costumes and sets. You may even have the opportunity of participating through talent shows and dance competitions. Included in your fare is food from the main dining hall and from buffets located throughout the ship. Many ships have 24-hour room service that is included in the price of the cruise. Meals are unlimited, giving you the chance to try foods that you’ve never had before. Although the specialty restaurants require an additional charge, many of the food outlets are included, so why not splurge on some food while you’re on vacation? Depending on the cruise line you choose, there are activities throughout the ship that you can participate in. Family activities include laser tag and miniature golf. Adults can enjoy exercise classes like Pilates and yoga. Some cruise ships even have water parks like Carnival’s WaterWorks parks and Norwegian Cruise Line’s Aqua Park with the 200 ft. Epic Plunge. There are programs for the younger kids that include kids’ clubs (typically ages three to seventeen) that have free activities so you can drop the kids off and enjoy relaxing by the pool. The cruise line will try and sell you packages through them for activities at ports of call, but if you exit the ship and explore on your own, you can avoid the high prices. Include some sort of brown bags or reusable lunch containers in your luggage and you can pack lunches on board the ship, like sandwiches from room service and fruit from the breakfast buffet to save more money. If you do decide you want to do one of the activities, consider finding a tour guide after exiting the ship. They’re often hanging out right where you exit and you can avoid paying a premium by booking through the cruise line. With so many ways to enjoy your cruise, it’s easy to have a fun-filled cruise that doesn’t involve alcohol.